The annual inter-school singing competition is a big deal for all concerned. 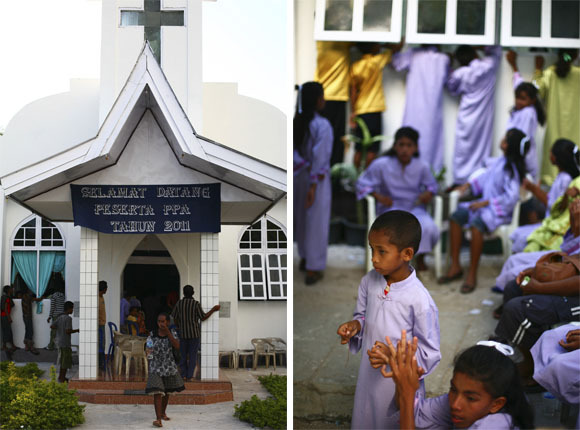 Hundreds of kids from primary schools throughout the western half of the island converge at the church with doting parents, teachers, extended family and dogs in tow. It is serious business, with three judges awarding a trophy and cash prize to the winning school. I was asked to photograph our local school, appearing sixth and eleventh on the programme. In between I could escape the stifling church interior and watch the real action outside. Strict teachers and hovering parents insisted on last minute practice of scales and smiles, and refinement of the conductor's arm movements. A team of mums prepared a take-away dinner of rice, fried noodles and unidentified meat morsels for every child, which was presented to them, along with a plastic cup of water, after their performance. The single-use plastic rubbish was a disturbing sideline to the event. Each group sang the same two songs, and by the eleventh round I definitely had the tune sussed. I felt a swelling of pride to see the village kids singing angelically in their matching polyester gowns (purple and green). Unfortunately we didn't win, or come second or third, but there is always next year. I truly enjoy your vibrant photos and stories of your time in Indonesia. Thank you for sharing them!